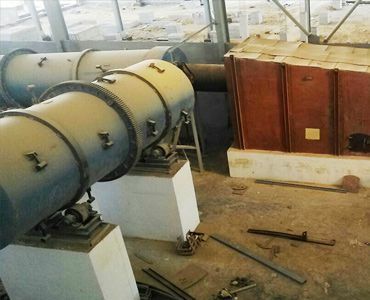 The waste of distillery is used to produce bio gas and Carbon di Oxide gas and some liquid waste. The waste is evaporated to concentrate the waste. The concentrated waste is called Slop / Vanesse or Stillage. It is burnt in the incineration boiler to consume it, get its fuel value and convert it into ashes. This ash contains 20 to 27% potash(K2O). This is very precious as potash is major nutrient for crops and is imported in our country. To use it as fertilizer it is granulated in the size of 1mm to 4 mm. The granulation is done by mixing the ash with binder and hardener. Gypsum, Bentonite, spent wash and sludge are used for this purpose. The granulation is done with the drum granulator. The mixed material is fed in the rotating drum. The RPM of the drum are kept low. The material rise with the drum shell and reach a height of angle of repose. After this height the material start rolling back. At this rolling material water, spent wash or condensate is sprayed in atomized condition. The surface of small particles or nuclei get coated with water. The powder in the material get deposited on the surface. Due to rotation it becomes round. As water is sprayed further more layers of powder are formed on the granule surface. The granules are dried in the dryer drum connected to furnace which generates hot air. 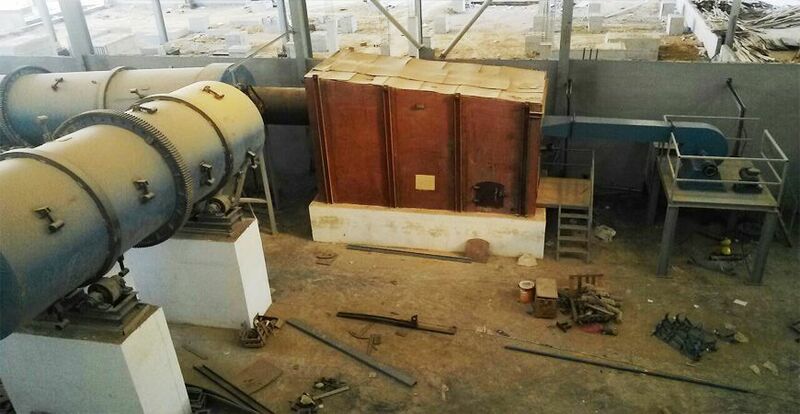 The fuel for furnace may be Furnace oil / HSD / Biogas / Wood / Briquettes of rice husk, Bagasse, etc. The dried material is cooled in the cooler drum where ambient air is passed through the granules. The cooled material is screened for over size and under size. The oversize after crushing and undersize are recycled. They provide useful nuclei for next cycle. The dust from hot and cold air separated with the cyclones and ID fans. The air is scrubbed with water for the separation of fine dust before being discharge to atmosphere through Chimney. It is zero effluent technology. Raw Materials Potash Ash, Gypsum, Bentonite, Spent wash, Sludge etc. After Sales service and Support	 Training of line and staff, spares and technical support. Incepted on 26th May 2010, Gayatri Fertiplants International Pvt. Ltd (An ISO 9001:2015 Certified Company) is a dynamic company with expertise in providing Turnkey Solutions for Chemical and Fertilizer Plants.